The following is an example of an oral surgery case in which CBCT images were employed to provide the surgeon with detail imaging of the patient with multiple supernumerary teeth. The patient was referred to the oral surgeon's office from the orthodontist for evaluation and treatment of impacted wisdom teeth as well as impacted supernumerary teeth in the left maxilla and mandible. 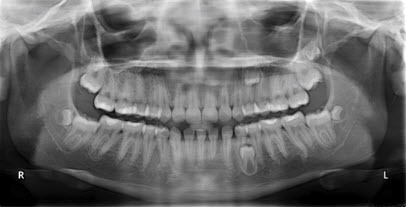 Evaluation of the Panorex (fig 1) shows impacted wisdom teeth and additional wisdom teeth (16a, 17a,& 32a) along with supernumerary impacted teeth 12a and 21a. Due to the inability to palpate either 12a or 21a, and the close proximity of these teeth to adjacent teeth and vital structures, a CBCT was ordered. Examination of the images from the CBCT (Fig 2 thru 6) shows the palatal location and the lingual location of teeth #12a and #21a respectively. Tooth #21a (Fig 3) is also quite close to the inferior alveolar nerve. After discussion of the CBCT findings with the patient and parent, informed consent was obtained for extraction of the wisdom teeth and all supernumerary teeth. Because the precise location of 12a and 21a were known to the surgeon, a palatal/lingual approach was used to access and extract 12a and 21a respectively. The patient recovered without event. 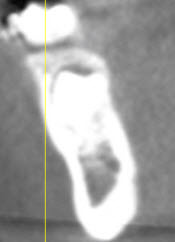 Correct surgical-orthodontic management of patients with impacted supernumerary teeth is enhanced by accurate diagnosis and precise localization of any supernumerary teeth.1 CBCT allows the surgeon and orthodontist to more accurately evaluate the exact location of supernumerary impacted teeth as well as assess their impact on the patient's orthodontic plan. Knowledge of the precise location of the supernumerary impacted teeth provides the surgeon with better diagnostic tools and thus allows him to better determine the risks and benefits of the surgery. This increased knowledge also translates into determination of better surgical approach when extracting the teeth and less risk to the patient. The use of CBCT imaging in patients with impacted supernumerary teeth provides the surgeon with superior anatomic truth when determining the precise location of the impacted supernumerary teeth. 1. Brauer HU. Case Report: Non-syndromic multiple supernumerary teeth localized by cone beam computed tomography. 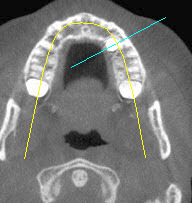 Eur Arch Paediatr Dent 2010; 11(1), 41-3. 2. 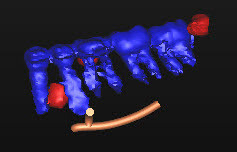 Walker L, Enciso R, Mah J. Three-dimensional localization of maxillary canines with cone-beam computed tomography. Am J Orthod Dentofacial Orthop 2005; 128(4), 418-23. 3. Garvey MT, Barry HJ, Blake M. Supernumerary teeth-An overview of classification, diagnosis, and management. J Can Dent Assoc 1999; 65,612-6. 4.Gurgel CV, Costa AL, Kobayashi TY, Rios SM, Machado MA, Oliveria TM. 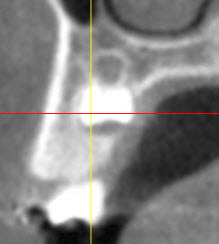 Cone beam computed tomography for diagnosis and treatment planning of supernumerary teeth. Gen Dent 2012; 60 (3), 131-5.